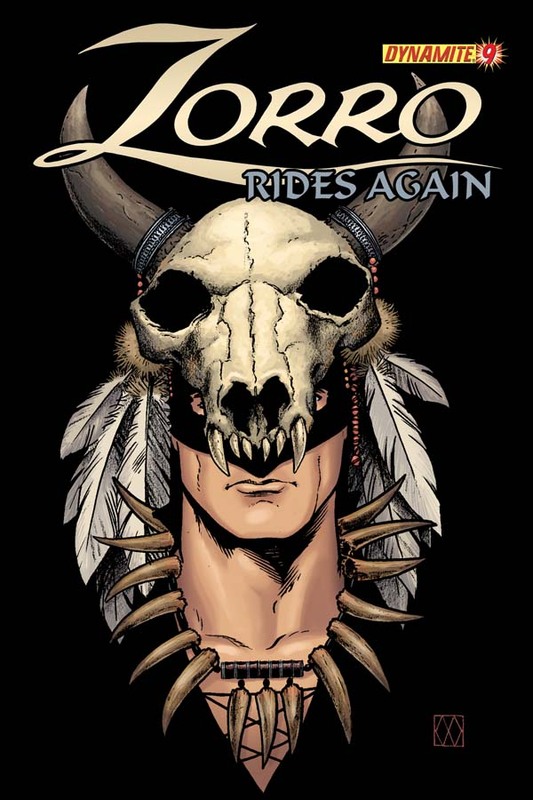 The Fellowship was fortunate enough to obtain a copy of ZORRO RIDES AGAIN #9 from Dynamite Entertainment. Matt Wagner wrote the story with art by John K. Snyder. The Alcalde is slowly going crazy with fear due to Zorro’s constant attacks. Don Fernando approaches Deigo De La Vega and asks him to come to a meeting of the caballeros regarding Zorro, the Alcalde’s handling of the situation, and how all of this will affect them and their prosperity. Meanwhile, the captain of the guard is concerned as to how he peons will respond to the Alcalde’s actions and fears a revolt. He decides to have the soldiers conduct raids to maintain fear and control over the citizens. As the soldiers carries out their orders they are ambushed…but who is their attacker? I’ve always enjoyed Wagner’s writing, whether it’s his Batman stories or his own creations Mage and Grendel. For an issue that doesn’t have a lot of action, tons of stuff is going on. Snyder’s art is great as always. I also would like to add that Mike Malbrough does the coloring and creates a beautiful atmosphere – bright sunny days, but decides to use purple for night instead of going with black. This book was a pleasure to read. ZORRO RIDES AGAIN #9 is in comic book stores now or available at www.dynamite.net.